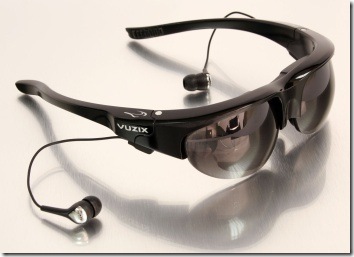 Vuzix continue to expand their personal video wear lineup with the new Wrap 920AV. They’re semi-transparent (i.e. they act like conventional sunglasses) so you can wear them as you stumble walk around in the real world. Vuzix are selling them as “Augmented reality” devices (they’re at least 5 years too soon for that to really work) but since they’re actually pretty comfortable to wear and have a very good picture I can see them being bought as straightforward personal video screens. The new model that’s not on the website yet is the VR1440. An upgrade to the already popular VR920, it’s display is 800×600 native resolution and will take a PC resolution of up to 1600×1200. Combining 3D display and headtracking it would make a compelling accessory for flight simulator fans.